Panther Plumbing,Inc. - At Panther Plumbing Inc. we take pride in our plumbing systems and fire protection work. If quality work is important to you, then give us a call. We strive to do the best quality work at an affordable price. We will provide a quality plumbing system that you can count on for years and years to come. Being licensed, bonded and insured is very important in selecting a plumber in today's market. Over 34 years in the plumbing trade gives the customer confidence that the job will be done right. At Panther Plumbing Inc. we take pride in our plumbing systems and fire protection work. If quality work is important to you, then give us a call. We strive to do the best quality work at an affordable price. We will provide a quality plumbing system that you can count on for years and years to come. Being licensed, bonded and insured is very important in selecting a plumber in today's market. Over 34 years in the plumbing trade gives the customer confidence that the job will be done right. From rough in to trim you can expect hands on service. 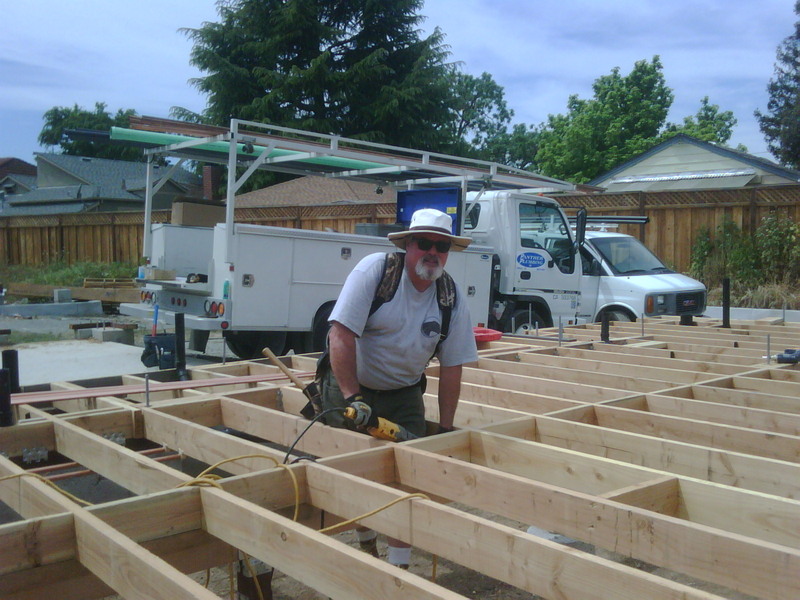 Fred is shown below drilling out some joist blocks for water pipe installation. Copyright Panther Plumbing, Inc. All rights reserved.